Everyone here in the Sheffield Scimitar loves Ice hockey, be it the players who actively play it and the fans who passionately support us in the seats. Everyone loves it for a reason. It can be because of the unique camaraderie that can only be found in ice hockey matches. It could be because of a special story behind admiring the great play. It could even be because you are a big fan of one of the players! There are as many reasons to love ice hockey as there are fans and players worldwide, and we would love to be a part of your story. If you want to chill and hang out with us, we are often at IceSheffield, with the Sheffield Steeldogs and other sports clubs. You can try your hand (or foot, better if both) with the ice skating, ice dancing or ice hockey lessons and matches. It can hold a lot of spectators (around 1,650 total for our two Olympic size Ice pads) so you can be sure that you can cheer and watch with a lot of passionate and friendly fans in a great environment. 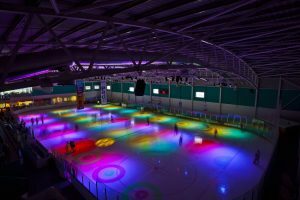 The prestigious Ice Academy of Sheffield also conducts lessons here, so if you want ice skating or hockey to skate inside your children’s heart, IceSheffield will be more than happy to assist. Whether you want to perfect your triple salchow and double lutz or make great passes in ice hockey, the competent trainers can definitely give you a hand and help you start on the right foot. Do not forget the matches and shows. There are regular matches with other Ice Hockey teams, be it on our home turf or with other visiting teams. There are also ice skating events here. You can enjoy a wonderful time just watching players play or skaters moving with the music. Start your Ice Story with us. Once you feel how fun it is, there is no turning back!